Sarens has moved a 2,922t Engie Fabricom wind farm substation onto a barge in Antwerp, Belgium, for transport to the North Sea. The destination was the Racebank wind farm, home to 91 x 6MW 154m Siemens wind turbines. For this operation, Sarens used SPMTs assembled into a configuration of four trains with 22 axles each, which were driven underneath the substation. The team then used load cells to determine the substation's total weight and center of gravity. While the SPMTs supported the weight of the substation, Sarens rotated its barge into position so it could receive the load. A winch and truck were used as the rotation point. Sarens said the challenge was to keep it in position. Its team had to account for the river's tidal fluctuations and strong current, making adjustments to ensure that the barge stayed level with the quay. Because the river's tide fluctuates by several metres, the operators strategically pumped water in and out of the ballast tanks to keep the barge aligned with the quay. With everything finally in position, the SPMTs drove aboard the barge. The substation was then safely secured, and the SPMTs drove out from underneath the load and back on to the quay. 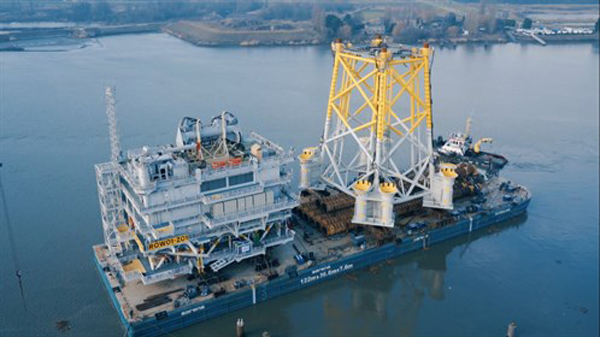 With the substation onboard, the barge was ready to sail to the North Sea wind farm. Sarens has released a video on how it used SPMTs and barges to move the substation.